Think the Covenant forces are tough when you're on your own? Bring a few friends in Halo: Reach and you'll see how tough they really are. To get a decent challenge in a co-op game of Halo 3 or ODST, players had to crank up the difficultly level, because the enemies got no more of less tough, regardless of how many Spartans were shooting at them. But all that is set to change with Halo: Reach, as the game will automatically alter the difficulty of your foes depending on how many people are playing. Speaking to Kotaku, Bungie's Brian Jarrard said that in Reach enemies in co-op play would not just toughen up physically, they'd also get smarter and trickier, make better use of cover and just generally be more dangerous to fight. Jarrard told the site that the enemies in a four player co-op game would be the most devilish enemies ever seen in a Halo game. I must admit that this piques my interest in Halo: Reach, and especially in the co-op mode. Taking on the role of a space marine and battling wily aliens with a few friends sounds like a pretty fun way to spend some time. 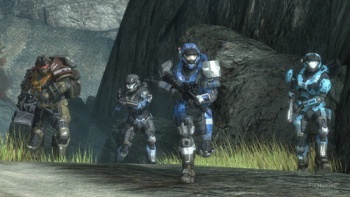 Halo: Reach gets released on September 14th.